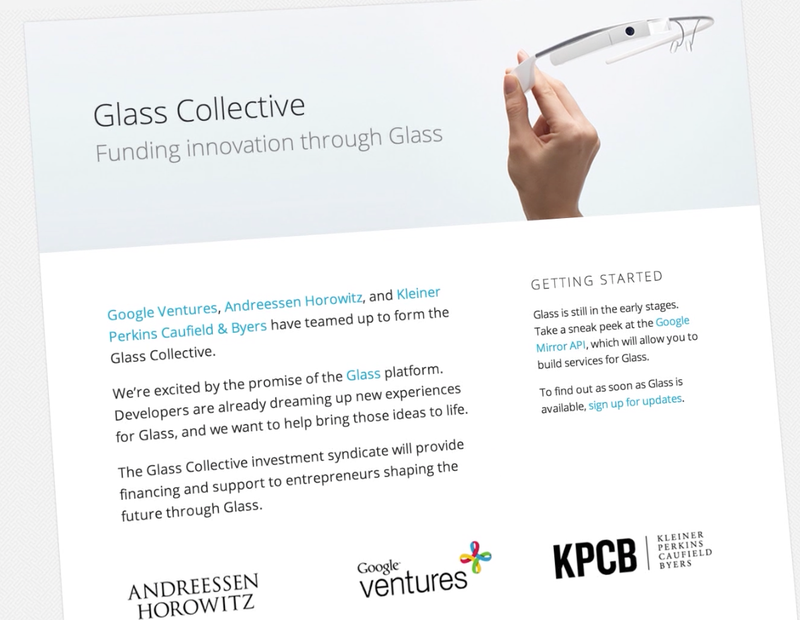 Today, Google Ventures announced a partnership with two of the biggest technology venture capital firms in the world, Andreessen Horowitz and Kleiner Perkins, on what they’re calling the “Glass Collective.” While this isn’t a fund, the three firms will be sharing seed investment dealflow for entrepreneurs and developers who are working on Google Glass software and hardware. If one firm sees an interesting opportunity, it will go to the others with it. The hope of this collective effort is to kickstart the developer ecosystem for Glass and bring it to mainstream users as soon as possible. Steve Lee, product lead on the Glass team, confirmed that Google will start shipping, hopefully within the next month, the Glass Explorer kits to developers who showed interest in Glass when it was introduced last year at Google I/O. So the three firms want to get in front of the activity that is currently, and will be in the future, happening in the ecosystem. With the billions of dollars that the firms have, it’s safe to say that they’d like to corner the market on Glass investments immediately. This is similar to the approach that Kleiner Perkins took with its iFund, which has invested more than $450 million into mobile applications. While the forming of the group doesn’t guarantee that the two firms will participate in a round of funding for any given project, the firms do tend to invest in other companies together already, so sharing what they’re seeing among one another makes sense. It was also made clear that there are no plans to bring in any other firms, so the “Glass Musketeers” will be going at this on their own. During the announcement, Google Ventures’ Bill Maris was joined by Marc Andreessen from Andreessen Horowitz and John Doerr of Kleiner Perkins. 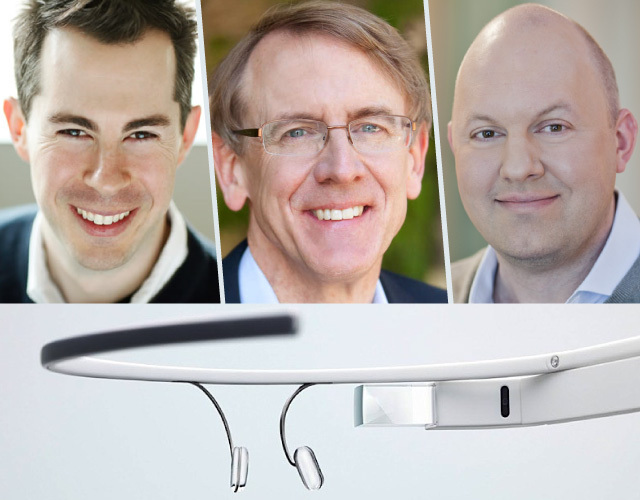 The three discussed their excitement for the immediate potential of Google Glass as a platform, not just a wearable computing product. 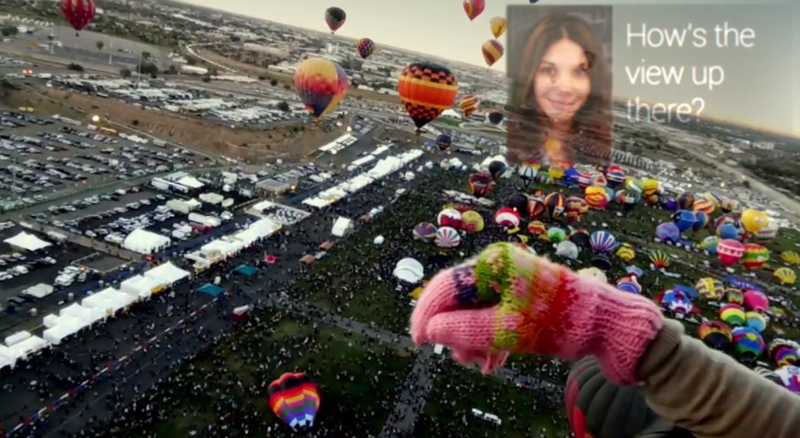 The Glass API, called “Mirror,” was announced and shown off at this year’s SXSW. Before the meeting started, we were able to test out the latest iteration of Glass, which has come a long way in just the past few months from what I could tell. That fact, tied with the obvious implications for real businesses to form around Glass, made these firms want to jump in early. I first saw and heard about glass from Sergey when it was just an idea of his. The early prototype didn’t function like the one you see today. As the team got built and the device has evolved, it’s more obvious that we could be sitting on the edge of a paradigm shift, similar to the ones we saw with browsers and mobile phones. It didn’t take much to get Andreessen and Doerr interested, as Maris says he barely got “Glass” out of his mouth before both said yes in separate phone calls. From those calls and discussion with the Glass team on how Google Ventures could get involved, the “Glass Collective” was born. Doerr went on to say that this group felt it “getting the band together again.” Kleiner Perkins was an early investor in Google, of course, and Doerr was also involved with Andreessen when he was working on the Mosaic web browser, which turned into Netscape, another Kleiner Perkins investment. We all know the power of platforms. When you have a great product and robust APIs that will unlock the imagination of entrepreneurs, amazing things happen. We saw it with the web, we saw it with the app store. 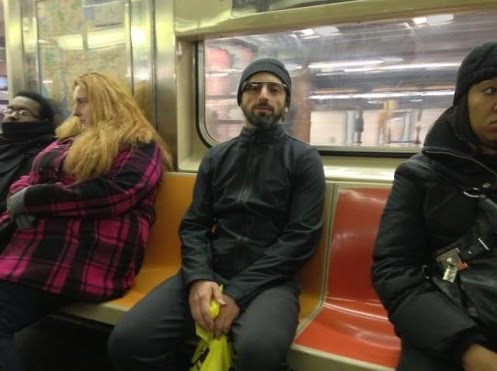 The recurring theme of this meeting, which Google co-founder Sergey Brin eventually rolled into on his bike, was that Google Glass is the next evolution of browsing the web and mobile devices, all wrapped up into one. The possibilities for Glass do seem infinite. As far as applications are concerned, there are still those who feel like the device will face criticism from privacy experts, citing the ability for rogue applications to be developed for nefarious activities. Today, these firms say that they will treat Glass investments like any other investment in that they won’t be funding any application that isn’t good for consumers in the end. As far as what those applications could be, Maris, Andreesen, Doerr and Brin shared some of their ideas for Glass that could make an impact in the world and bring a bit more fun to it. Andreesen would like to see an interactive zombie game on the fun side, but feels like the implications for Glass’ usage in healthcare, for surgeons and patients, could be huge. Doerr agreed and added his hopes of seeing Glass used in the education sector to help remove some of the isolation in today’s learning environment. The person who has spent the most time with Glass, Sergey Brin, would like to use Glass as a viewfinder for his digital SLR camera and tracking his heart rate and performance while riding his bike. So far, the applications that have been conceived and built during Glass’ early hackathons have been promising, the Glass team said today. The Glass Collective’s first investment could be coming soon, as Maris stated that there are a few developers working on interesting things that might need some money to get going, and Doerr added that Path and Twitter are already thinking about the applications that they can build on top of the Glass device and platform. With the experience and history of these three firms, it’s safe to say that other collectives like this will have a hard time getting set up and launched in time to make early deals. When you have the ability, as an entrepreneur, to get access to three world-class investment firms, one of which has direct access to the Google Glass team, it will be hard to justify taking your idea elsewhere. One thing is for sure, Google Glass isn’t going to be the easiest sell to consumers, as it takes some time getting your eyes used to seeing notifications pop up in front of your face. To be successful though, these firms don’t think that it needs millions of adopters to get entrepreneurs excited about building things on the platform.